One of the simplest and least expensive ways to refresh a room is with throw pillows. It is particularly easy if you were savvy enough to select neutral-colored upholstery. You can add the latest trendy colors and prints without making a big commitment. Go designer, Boho Chic or funky. Looking to update with a sophisticated designer look? Z Gallerie has two coordinating pillows that can hike the glam factor. The 24-inch-square Trefle pillow ($79.95) was created with a classic geometric in aquamarine with gold appliqué. Team it with one or two of the Mongolian 22-inch-square pillows ($149.95 each) in aqua. The Mongolian pillows have fur on the front and faux suede on the back. Just add some coordinating accessories and you have a whole new look. See zgallerie.com for local stores. The popular ikat print pillows are a good option if your taste is classic with a touch of Boho Chic. One of the great advantages of buying Pottery Barn pillows is you can keep your inserts and just change the covers. This option is perfect if you don’t have a lot of storage space. The Sarina Ikat Print Pillow Cover ($29.50) comes in four colors and two styles. They are 20 inches square, have a zipper closure and are machine washable. Inserts are sold separately. See potterybarn.com for local stores. Jean Paul Gaultier is your man if you desire design that pushes the envelope. Remember the cone-shaped corset he designed for Madonna’s “Blond Ambition Tour” in the 1990s? You can show some of his cheeky style with his Corset pillow ($225), an homage to Madonna’s tour. The front features a corset motif with black eyelets and lacing in black satin ribbon and the back is faux suede. A more subtle but still avant-garde choice is Gaultier’s Fiere ($225). 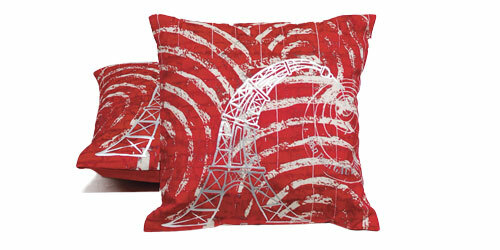 The front of the suedelike fabric features a spiral pattern with a silver metallic detail of a stylized Eiffel Tower. Roche Bobois, 19907 Biscayne Blvd., Aventura, 305-935-0035, roche-bobois.com.